I knew about this parameter years ago but never found interesing info about how it works. Finally, trying Mafia 3 yesterday (one of the really few games without perfect smooth framerate in my 1600 games library) I decided to put some effort on it. After several tests I managed to make the silksmooth work and the difference is like night and day. In order to it to work you have to use Framelimiter to a v2 value, and (this was the difficult one to know) use windowed mode. This silksmooth doesn't work in exclusive fullscreen mode. It turns out that mafia 3 does not have borderless mode, so I had to use an autohotkey script to make it borderless (no other application works). - Autohotkey script to change desktop resolution to 2560x1439@50hz, launch the game, wait to Mafia 3 windows to have focus and change windowed mode to borderless. Then waits until game closes to restore desktop resolution. well silk smooth introduces input lag, bu yeah is great for games with sttutering or bad ports they became more smooth in gameplay. But not really for fast paced games since the input lag is very obvious. This sounds awesome. MaLDo the master of gaming,might try this on one of my monitor's/tv's without freesync/gsync .Thanks. Is this like frame interpolation? Always wondered what this was. But no fullscreen kind of kills it. Have you tried using Scanline sync or 1/2 scanline sync with this game at all? Most probably not. But it's not clear. 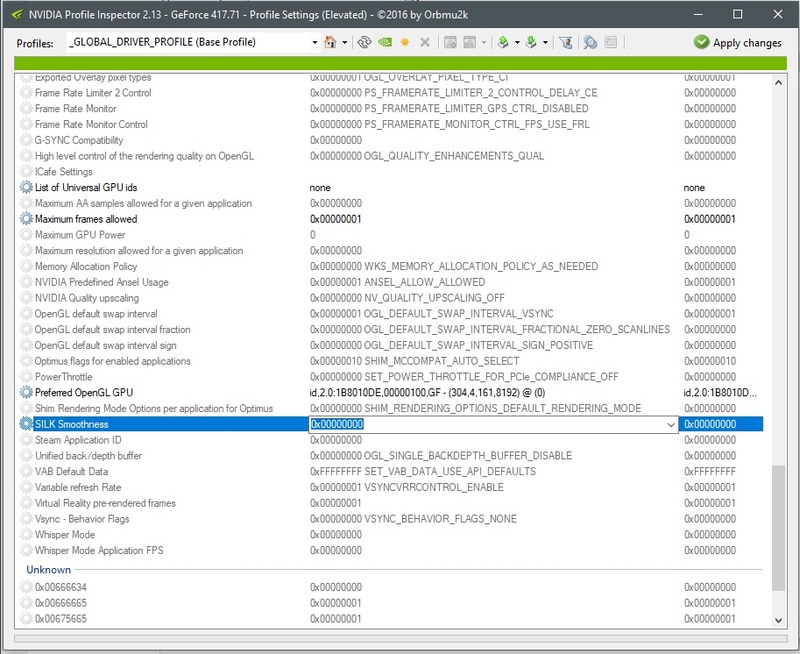 A while back (2016) nvidia gave a presentation where this option was visible in the nvidia panel, and someone from the audience asked what it is. Tom Petersen refused to answer by dodging the question. It seemed to have something to do with fast sync (since that was the subject of the presentation) but nobody knows for sure. I'm just guessing here, since I have no system to test this on. I had this working in 7 Days to Die a while ago. I wondered why it stopped working, it must have been because of the full screen mode. It should also work with borderless G-Sync it did back then I'll test it again during the next few days off work and shall edit this post. Make a new post quoting it otherwise nobody will know you updated it. 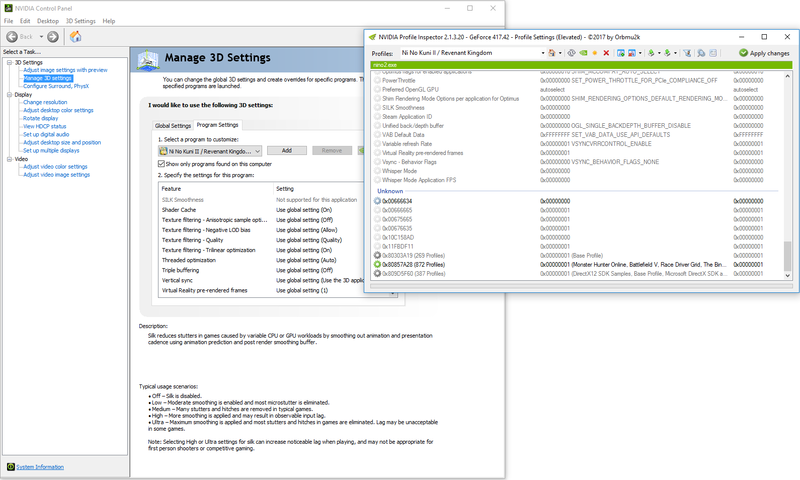 But NVCP doesn't have a second setting, that by default doesn't allow use SILK Smoothes. 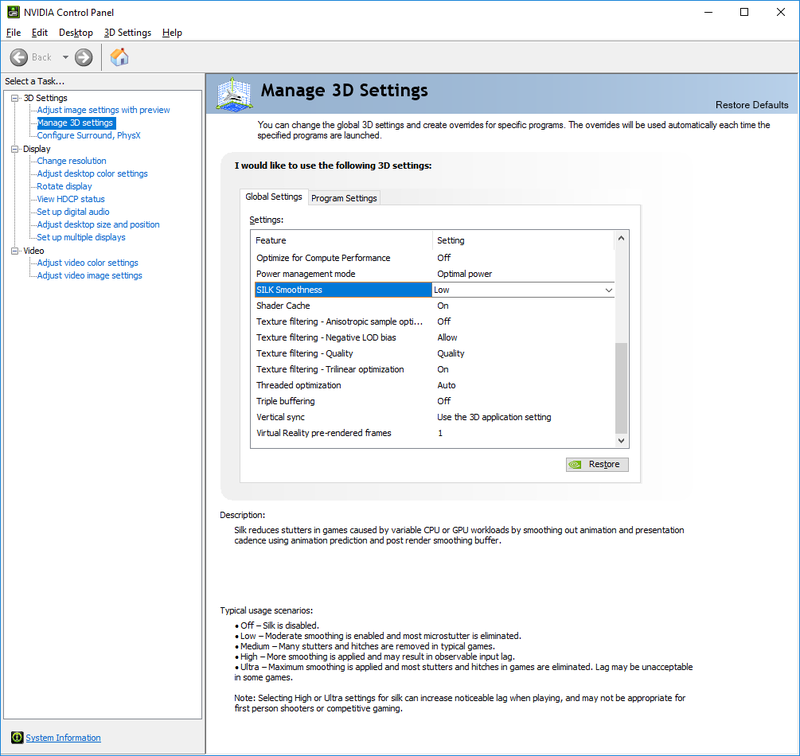 The driver reads "SILK Smoothes" option for DX10+ applications only. It seemed to have something to do with fast sync (since that was the subject of the presentation) but nobody knows for sure. BetA, Dj_ALeX, -Tj- and 1 other person like this. I just enabled the registry tweak and my default profile listed low as default while there is an off option. What's strange about this is that I have never tweaked this setting before, I didn't even know it existed before reading this thread. So basically the default configuration has it enabled already? I wonder if disabling it improves latency. EDIT: After going in the game profiles I noticed that none of the games I have installed supports this setting, it's greyed out. I wonder if setting it to max makes latency worse, as that's easier to test. Because if it doesn't, then it stands to reason this option doesn't actually work. Input lag rises with the smooth value. It’s easily noticeable. So this second setting actually enables it in profiles? Or why did @artina90 mentioned it's grayed out in profiles? 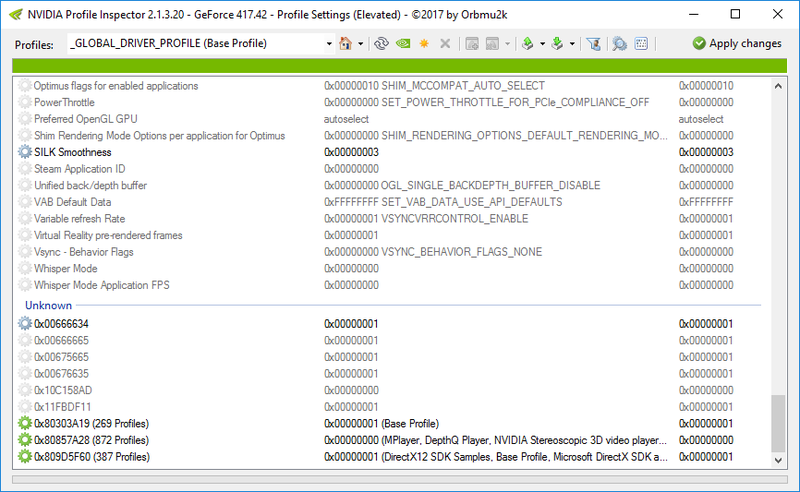 I haven't opened Nvidia Inspector in months, I just reported my findings in the NV CP after adding the registry key. but the logging feature work only on the debug driver. hmm, I added that registry key and it enabled it globally, but in profiles Im facing the same issue as artina90. I tried to enable it in COD Infinity warfare and COD MW remastered.. Then I checked other profiles and it stays greyed out by those too. EDIT: nvm I checked again when I forced it in nvinspector COD MW remastered profile to no 0x000002 and now when I opened nvcpl profile again it said its at high.